HC-B scores a point and a half for making Harlem look like New Orleans and Times Square look like Amish country and for making midnight look like mid-afternoon. Weegee scores many, many more points for making better photos; talking to, interacting with, and having fun with the subjects of his photos (there are so many people looking at the photographer and smiling, that it’s easy to imagine Weegee clowning around); writing captions/text; and championing racial equality. 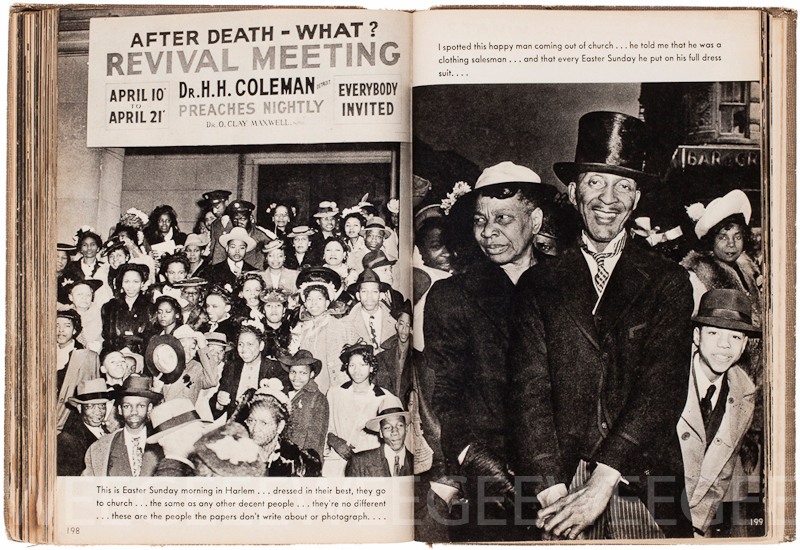 The photo on page 198 was made on the steps of Mount Olivet Baptist Church: “The history of the struggle for racial justice and social reform in New York City cannot be written or fully understood without knowledge of this church.” 10 more points for Weegee! Relevant and thought-provoking text in a photo – 2 points for Weegee! Weegee was there first, two years before HC-B, 3 more points for Weegee! The design/layout of this page spread of “The Decisive Moment” is unimaginative, minus 1 point for HC-B. The design/layout of this page spread of “Naked City” is cool, plus 2 or 3 points for Weegee. Round 1 goes to Weegee!